Absolutely. We pride ourselves on being female-friendly. In addition to our regular classes, we also offer a weekly “women’s only” BJJ class, as well as monthly women’s self-defense seminars. No, we are a month to month academy. We don’t believe in forced contracts. We are confident you will enjoy the art and the atmosphere and want to stay. Do I need a Gi (uniform/kimono)? We offer gi and no gi classes. We have loaner gis for your first few gi classes, but yes, you will need to purchase your own gi for gi classes. We are an authorized dealer for a few different brands. See Paul or Steve for information on how to purchase in-house. The obvious answers are self-defense, sport, and fitness. You’ll increase your strength, flexibility, and cardio, but we strongly believe that BJJ can also help you in all areas of your life. You’ll build confidence, mental focus and the ability to remain calm and find solutions in stressful situations. You’ll also enjoy the camaraderie Jiu-Jitsu offers and develop a sense pride in yourself and your teammates. Rolling is another word for sparring. This is where you get to practice the techniques you learned in class against a resisting opponent. The object is to “catch” your opponent in a submission. Most find this game of human chess the best part of a Jiu-Jitsu class. Do I have to Roll/Spar? Ultimately sparring is optional, but it is our goal to work towards it with you. In the beginning, you will often be paired with more experienced practitioners who can exercise a great deal of control until you are comfortable. Can I try out a class before I sign up? Absolutely, the first class is always free to try out. Do you offer classes for beginners with no martial arts experience? Yes, all of our classes are open to all skill levels. We also offer a dedicated BJJ fundamentals class several times a week to help new students build a solid foundation. This will vary depending on the class, but typically 15-25. When can children begin training Brazilian Jiu Jitsu? This varies between children, but we recommend starting at age 4 and offer Pre-Jitsu classes for our youngest students. Learn more about Pre-Jitsu here. What is the belt system in Jiu Jitsu? For kids, it’s white, gray, yellow, orange and green. For adults, it’s white, blue, purple, brown and black. I want to fight MMA, do you teach MMA at your academy? Our primary focus at Main Line United is Brazilian Jiu Jitsu. Jiu Jitsu is an integral part of an MMA fighter’s skill set. 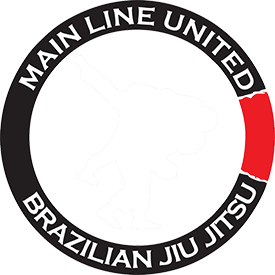 We also offer a basic striking/MMA class to help you begin to build your foundation. Am I too old for Jiu Jitsu? No, some our most skilled students are in their 40s or older. 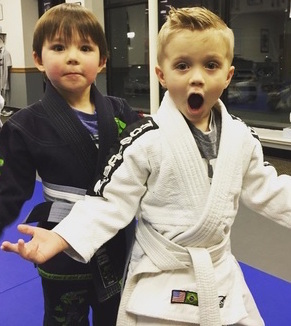 We truly believe Jiu Jitsu is for everyone. Train to your ability and smarter not harder with adequate rest and you’ll be just fine. Do I need to be in shape to train jiu-jitsu? Jiu-Jitsu is one of the best exercises you can do. Certainly, a base fitness level will help, but prior conditioning isn’t necessary to start training. Don’t get in shape to do Jiu-Jitsu…do jiu-jitsu to get in shape!